Learn all about Ireland’s tax exemption on income from works of cultural merit, and how this affects this careers of Irish residents. The differences between editing, beta reading & copyediting. Do our creators prefer The Compliment Sandwich or the Red Pen of Doom? This will be my first time on panels so if you are there, then please be gentle! PS details might be subject to change. On a related note I’m also attending Loncon the weekend before – but only as an attendee. Since the first satellites broke Earth orbit, one of the inherent complexities of space travel engineers, scientists and later ship crews have wrestled with, is transmission delay. The speed of light is 299 792 458 metres per second, if a transmission is sent from Earth to Mars then, depending on their positions relative to each other, the signal will arrive between four and twenty four minutes later. In the period prior to first contact, when human scientists explored the solar system via robotic probes, this presented a significant engineering challenge. Instructions when issued from the ground, had to be sent well in advance, to allow for them to arrive before the probe needed to take action. 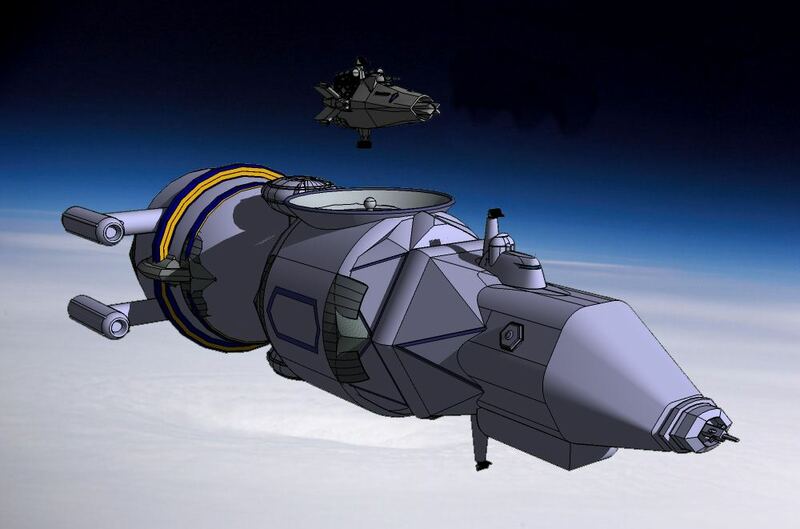 If an unforeseen event occurred then the probes were forced to operate on effectively autopilot. Given the limitations of these early machines, this often resulted in the failure of a mission. In the aftermath of the Contact War, as the first jump capable ships began to venture beyond Earth’s solar system, this limitation suddenly presented a real danger to life. A radio transmission from even the next closest solar system would take years to reach Earth. One means of summoning help was quickly developed – the emergency message drone or EMD; basically a small jump drive with a basic engine, these could be used to dispatch a mayday should a a vessel get into trouble. As a means of providing emergency communication for a ship to summon help it was just about acceptable but of little use for a home base to contact a ship. For Battle Fleet in particular, this represented a significant challenge. When a ship jumped out, it effectively passed beyond the reach of ground side commanders and the only way to call a ship back, would be to send another ship after it. Given the fleet’s extremely limited resources, this presented a significant strategic risk, with the danger that the fleet might, in the event of attack, suffer defeat in detail. In many respects this was a situation not unlike that faced prior to the invention of the telegraph during the nineteenth century. Fortunately there was a potential solution. Among the technologies obtained at First Contact was a Faster-Than-Light (FTL) receiver. Ehile this device was returned to the Aéllr at the end of the Contact War, its very existence proved the possibility of FTL transmitter. 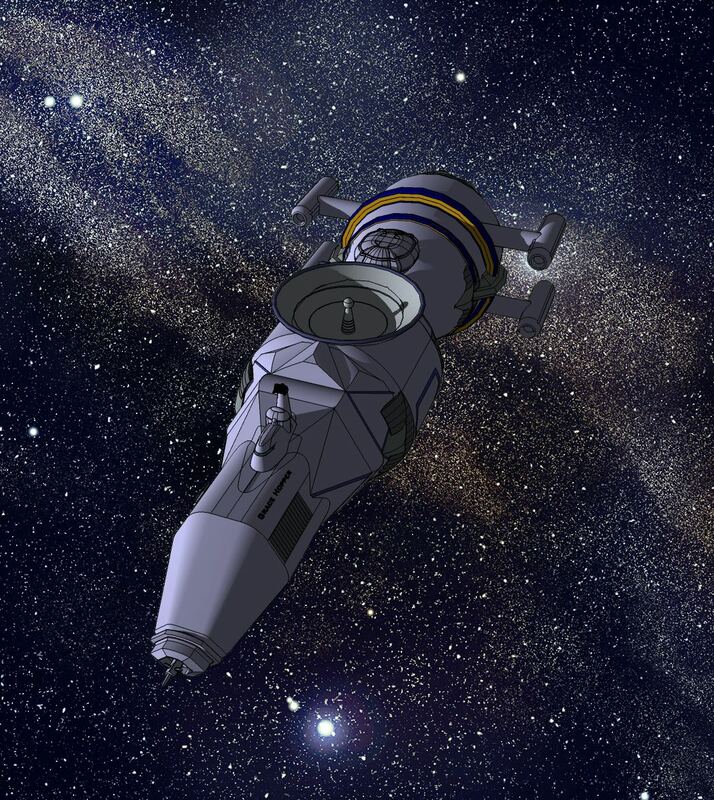 In the run up to and during the course of the Contact War, humanity had successfully adopted a range of technologies, thus with misplaced confidence the leaders of the FTL transmitter project predicted that the first prototype would be ready for testing with four years – a prediction that would come to haunt them. Unlike jump drives, fusion reactors and the various other technologies Aéllr, no human had even seen an FTL transmitter, much less been able to study one. The FTL receiver that was examined had been about the size of a domestic refrigerator, the researchers mistakenly assumed that the transmitter was of a similar size or slightly larger. This assumption would cost the project ten years and result in the removal of several project leaders. It was only in 2045 when researchers in University of Washington, proved mathematically that the transmitter had to big to function, with a resonance chamber that would needed to be at least twenty meters across that progress began to be made. While this breakthrough ultimately resulted in the successful development of an FTL transmitter, the size and mass of the equipment – several hundred tonnes – was far from the ‘two refrigerators’ volume requirement that the fleet had originally been told to expect. Not only was it clear that the fleet’s existing ships could in no way incorporate such equipment, but that no conceivable warship could absorb such mass and bulk, without hopelessly compromising all other aspects of its functionality. With this in mind it became clear that the only reasonable course of action was the development of a new category of ship – the Communications or Coms Ship. At this point FTL transmitter technology was still very much in development and a coms ship built at this stage might well be rendered obsolete is a fairly short time frame. However the fleet was eager to gain experience and it was felt that a single ship would allow it to ‘test water’ without committing too deeply. Faced with the introduction of the very new and unproven transmitter technology, the decision was taken to use a proven design as the basis for the ship itself. The Antonov SK-10 mid range transport was chosen, The drive section was altered to accept a larger more powerful reactor, which resulted in the reduction of fuel stores and the heat sink being displaced forwards into to the command section. The bridge structure was enlarged to provide a control compartment for the transmitter. Midships, in what had originally been the cargo bays was subject to massive alterations, with the entire space occupied by the transmitter equipment. The most obvious feature being the transmitter dish mounted on the dorsal hull. Even with such a large volume, the transmitter itself could not be omnidirectional, instead would be mono-directional, which would mean that the transmission would have to be at least roughly ‘aimed’ at intended message recipient. Since the vessel was a prototype and frequent access into the hull was expected to be needed, several large access panels were added. The reduction in fuel and stores significantly reduced the ship’s effective range but since it was assumed the vessel would either spend much of its time close to base or in the company of other ships, this was seen as acceptable. Christened in 2052 Grace Hopper after the pioneering American computer scientist and United States Navy rear admiral, the ship was seen primarily as a prototype and testbed. As such much of her first five years of service was spent engaged in tests and time in dockyard hands being adjusted. Among the discoveries in this period was the fact that the mono-directional transmissions, while acceptable for communicating with planets was difficult to aim with sufficient accuracy at a ship as the beam’s spread was even narrower than projected. The experience gained from these tests would be fed into the design process for the section generation of Coms Ships. 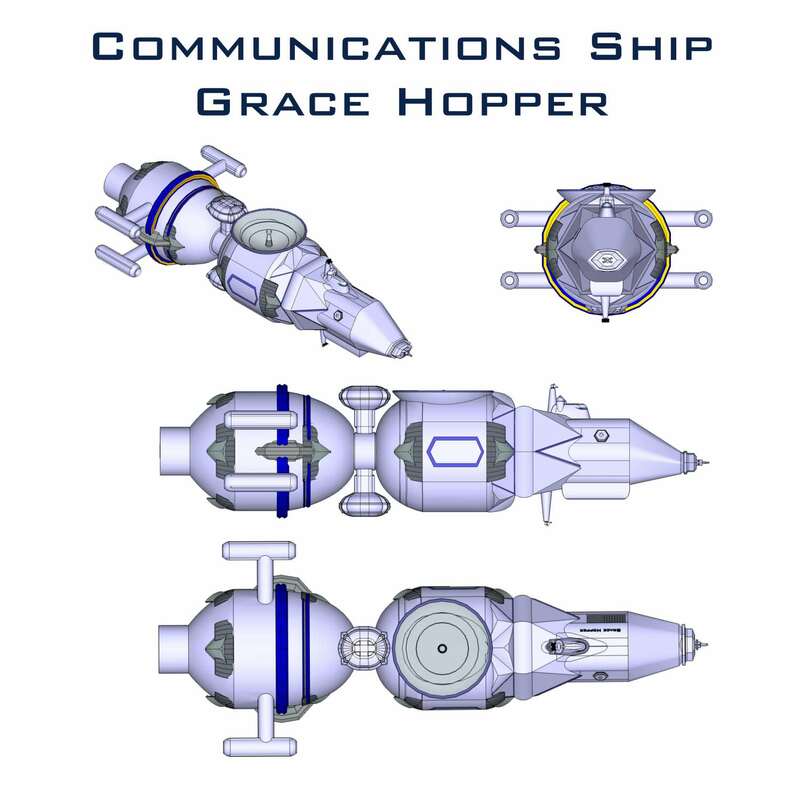 While not intended as a line vessel, the Grace Hopper would be involved in a number of fleet operations – most notably the search for the transport St Mary and as the coms relay during the second Three Planet’s Talks. Additionally the ship provided communications support during the early days of the settlement of Landfall. Grace Hooper was superseded by the Emmy Noether Class and in 2062 was reduced to reserve. While it is understood that a number of commercial and private groups have expressed an interest in obtaining the ship, to date the fleet has not indicated any desire to dispose of her. The Last Charge has now returned to me from my editor. No clangers like the infamous Thurder incident – overlapping names appears to have been my error of choice this time round. Now I have to do another complete read through, just to make sure no problems have wriggled their way in before I start preparing the file. Work has begun on the blurb, with suggestions being bounced off various friends, family and associates. Cover art – still on the to do list. On the subject of Ships of the Fleet, I’ve rejigged and expanded the histories of the Fortitude and Resolutions to make them line up better. Wrote from scratch the history of the Contact War era battleship Resilient, two never-was designs and I’m now working on the write up for the Titan class. The models for Resilient and the Titans are done. That leaves between now and October, finishing the write up, a couple more basic models for the never-was designs, doing the artwork, pulling the file together. Which will be tough. On a mildly related note I am now on Goodreads, so feel free to drop in and ask any book related questions that spring to mind.